Description: Join us at Aldridge Gardens on Saturday, March 2nd from 9:30 to 11:30 a.m. for the 21st Annual Hoover Arbor Day Celebration. Presented by the Hoover Beautification Board, this community-wide celebration will feature a formal ceremony honoring winners of this year’s 4th Grade Arbor Day Essay Contest, FREE TREES for Hoover residents, a ceremonial tree planting, full access to Aldridge Gardens and the Roots gift shop, as well as assorted refreshments from local businesses. ISA Certified Arborists and other plant professionals will be on site to answer tree related questions and to assist residents with selecting an appropriate tree for their yard. Limited numbers of the following tree species will be available: "Highbush" blueberry, American hazelnut, American fringetree, "Cherokee Princess" flowering dogwood, Eastern redbud, American hornbeam, Carolina silverbell, Kentucky yellowwood, "Wildfire" blackgum, common persimmon, red maple, sugar maple, bald cypress, white oak, Southern magnolia, tulip poplar, and black walnut. 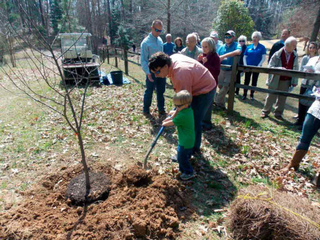 Arbor Day in Hoover is the result of a continued partnership between the City of Hoover, Hoover City School System, Alabama Power, Aldridge Gardens, local businesses, and numerous volunteers. These partners believe in the value trees bring to our community and they understand the importance of planting the right tree in the right place.